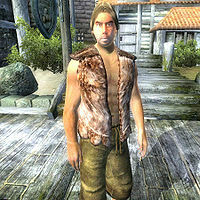 Wilhelm the Worm is a Nord pauper who lives a rather poor existence on the Anvil dockside. At first glance, Wilhelm appears to be just another beggar, but fortunately, the city has allowed him a bedroll on the second floor in the Harborside Warehouse, mostly to keep out the rats. That doesn't bother Wilhelm, and he sleeps there every night until 6am, and then heads outside for his daily routine. For the next twelve hours, he will wander randomly around most of the city, his preferred areas being the dockside or inside the main city near the dock gate, on the grassy area behind Jesan Sextius' house or even as far away as the main gate. At 6pm, he picks up some food from one of the many crates in the warehouse and consumes it for two hours. At 8pm, he once again goes outside for some more wandering until his bedtime at 2am. Wilhelm's clothing reflects his lower class status: A huntsman vest, a pair of sack cloth pants and sack cloth sandals. He only carries a small amount of gold. Inside the warehouse, you'll find nothing but clutter and food. Even though the door is unlocked, Wilhelm will still kick you out if he finds you in there. When you meet him for the first time, he will be quite honest about himself: "They call me 'Wilhelm the Worm,' because dirt suits me fine. Town lets me live in the warehouse to keep out the rats." And he is pleased with the city of Anvil with only one exception: "Nice friendly folk in Anvil, even the Countess greets me in the street. Well, except for that Newheim the Portly. He's a mean old scroat." Wilhelm's bedtime is determined by which AI package gets chosen in the evening. If any of his ExploreAnvil packages are chosen, he will go to bed at 2am. If his regular harborside package is activated, Wilhelm will jump into bed at midnight. The door to the Harborside Warehouse is not owned by the proper faction which can sometimes get Wilhelm the Worm killed for trespassing. This bug is fixed by version 3.2.6 of the Unofficial Oblivion Patch. This page was last modified on 12 July 2018, at 02:09.